Thus, I apologize why I’m posting my Hanukkah recipe of choice just hours before we kindle the first of eight candles. A completely commitment-free Sunday gave me the opportunity to research, rummage through my pantry, and taste-test what I believe is a perfect finale for your holiday. If you aren’t familiar with the Hanukkah story, we’re essentially celebrating miracles on many levels — one of which is that oil lasted eight nights instead of just one! We savor the oil not only through the menorah lighting, but also through foods fried in oil. The most popular dish of the holiday is sufganiyot (soof-gone-ee-yoat), a fried and jelly-filled donut. 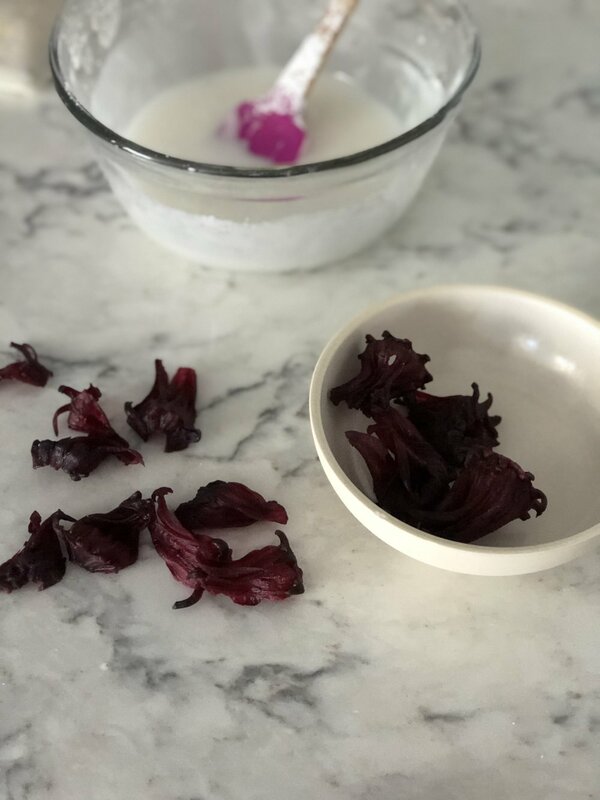 Here’s my take on the treat, inspired by Molly Yeh and topped with beautiful Trader Joe’s finds, particularly these dried and sweetened hibiscus flowers! 1. In a medium bowl, combine the yeast, warm milk, water, and 1 teaspoon sugar. Leave aside for about 5 minutes, until it becomes foamy. 2. Meanwhile, in the bowl of a mixer fitted with a dough hook, mix salt, flour, cinnamon, orange zest, and remaining 1/4 cup sugar. Add the eggs, vanilla, and yeast mixture, and mix to form a very stiff dough. Knead for a few minutes. Then, with the mixer on, begin gradually adding butter, tablespoon by tablespoon, until incorporated, about 8-10 minutes. Be sure to scrape down the dough hook occasionally, until dough is smooth and slightly sticky. Transfer the dough to an oiled bowl, cover it with plastic wrap and let it sit at room temperature until it has doubled in size, about 2 hours. 3. Turn dough out onto a floured work surface and roll it out to 1/2” thickness. Cut out 2 1/2” circles and transfer to a parchment-lined baking sheet. When re-rolling scraps, first press together and then allow the dough to sit for about 10 minutes before proceeding. Cover circles with plastic wrap or a dish towel and let rise for another hour or two, until doubled. 4. In a large heavy pot fitted with a thermometer, heat 3-4 inches of oil to 350 degrees. Fry the donuts in batches of 3 or 4, for 1 1/2 minutes on each side. Transfer to a wire rack to cool completely. 5. Meanwhile, fill a squeeze bottle or piping bag with jam. To make the glaze, whisk together the powdered sugar, milk, vanilla, and salt until smooth and of a consistency slightly thicker glue (If too thick, add a little more milk, and if it’s too thin add a little more powdered sugar). 6. 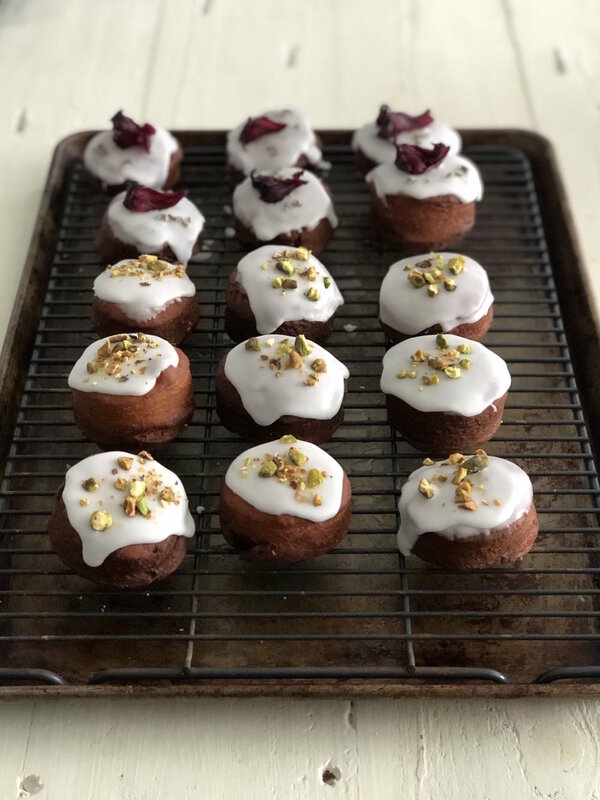 Dip the cooled donuts into the glaze and let any excess drip off. Stick the squeeze bottle straight down into the center of the donut, wiggle it around to make space, and fill it up with jam. Top with a sprinkle of pistachios or a hibiscus flower petal.